By Roger And Lucielle K.
I need to replace basement windows with egress windows. I would like larger windows to get light into basement. I have an old cinder block basement. I store stuff down there but would like to have the blocks sealed from the dirt/dust that occurs. I'm not sure if there is anything that can be done or not. The crew was courteous and the work appears well done. Scott is very knowledgeable and kept me informed about progress. The work would likely have gotten done sooner if the city building inspector had arrived when requested. The Waterloo building inspector told me the work looked very good and that he has never received a complaint against MidAmerica Basement Systems. The only minor issue was that the utility locating service came to our residence in Waterloo twice before getting to the job site in Washburn. I have (and will continue to) recommended MidAmerica Basement Systems to my friends, family, co-workers, and neighbors. I am so happy with everything your company has done for me from start to finish. Thank you! This rating is in response to an annual inspection. Service guy was personable and helpful. We will properly install a hidden drainage system in your Fairbank basement and completely encapsulate your crawl space with CleanSpace vapor barrier. We are here to solve the problem for you. Unlike the average Fairbank contractor we use completely inorganic, waterproof materials. Even if the basement floods your walls and floors will not be damaged by the water. These waterproof products are patented and are built to create an attractive finished basement that lasts a lifetime. Foundation problems such as bowing foundation walls destroy your Fairbank home’s value and can be dangerous. Our in-house team of structural and geo-technical engineers are here to help. We design and install the right solution and usually have the project finished in less than a week. You will have peace of mind as we provide a 25-year written warranty against defects on our foundation products. The sunken, cracked concrete around your Fairbank home is both an eyesore and a safety hazard. It is also likely to get worse, but we can fix it for you. If you think you might have radon gas seeping into your home, it's time to take action. 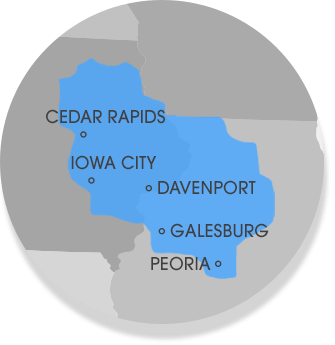 We help homeowners in Fairbank, IA with radon testing, and can even provide a FREE quote for the cost of a radon mitigation system for your home. Water is drained to the TripleSafe Sump Pump to be pumped out, keeping the basement clean and dry! WaterGuard is able to be installed with all foundation types. Installing WaterGuard around the perimeter will allow the space to still be used for storage or recreational purposes. Homeowner, Alex, and Amanda were having water seeping into their basement. They tried cleaning it up themselves but it was a problem that kept occurring. They thought it was time for the experts to come in and take a look at their basement, MidAmerica Basement Systems. Design Specialist, Justin was able to come out to their home and give them the best recommendation to fix their problem. Justin recommended that they had their basement fully waterproofed. Installer, David came to their home to install WaterGuard, TripleSafe Sump Pump, IceGuard, LawnScape Outlet, and CleanSpace Wall System. WaterGuard is a piping system that was installed around the perimeter of the basement. This will allow the water to be intercepted and then drained away safely to the TripleSafe Sump Pump to be pumped out of the basement. Having this system installed will allow Alex and Amanda to enjoy their basement space still. They will be able to use the space for storage or even recreational. Now Alex and Amanda will not have to worry about water seeping back into their basement and causing a mess! Their basement will now stay dry thanks to MidAmerica Basement Systems! If you too are experiencing the same issue as Alex and Amanda, do not hesitate to reach out to us. We would be happy to help you out! Homeowner Rodger and Lucille were recently contacted by MidAmerica Basement Systems when it was time for their annual maintenance. During this annual visit Service Technician, Kyle McCarty found a small crack in the foundation of their home. Having these small issues fixed early can ensure that they will not turn into larger issues.